Being very busy last week with the crush before Christmas caused me to use #BDSI (Boxing Day Sew In) on Twitter this past Monday, December 26th to finish up the Orange & Black quilt for my nephew for his Christmas present. It was not a late gift as my side of the family did not get together until Monday afternoon to accommodate everybody's holiday schedules. 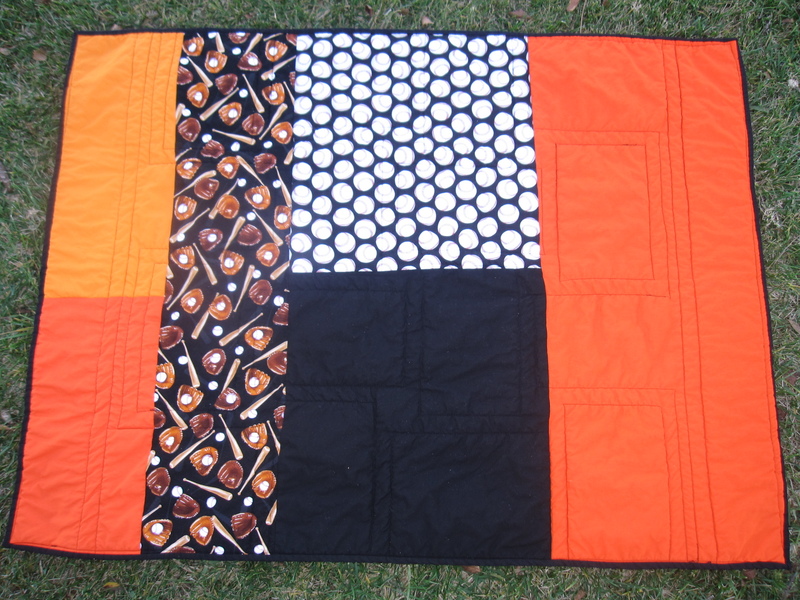 Orange & Black quilt for N.
Fabrics: Various Kona Solids and two baseball patterns from local fabric store. 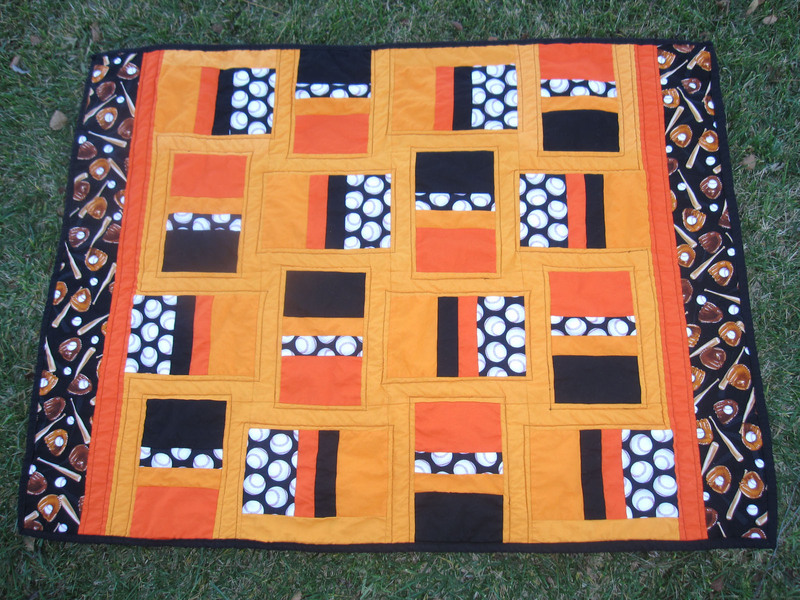 Orange & Black quilt front - 40"x 50"
I have four nieces of various ages so I decided this year for Christmas to give them a little handmade item with a favorite gift card of their choice nestled inside. 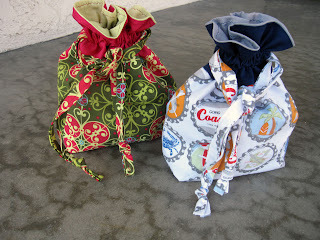 For my teenage nieces I tried a new tutorial for Lined Drawstring Bags from Jeni of InColorOrder. Great tute - go check it out. Both bags came together very easily and were well received by both girls. Success! For my younger nieces I made zip pouches and they loved them. My SIL told me that the bag I made below for B. looks very similar to the new backpack that my niece had yet to open for Christmas. The pouch would be a perfect accessory to the backpack which made me happy. 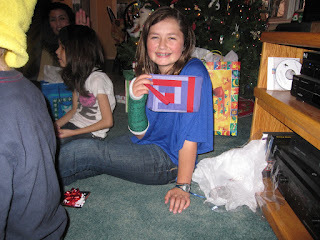 Love this girl...such a sweet kid. So the Christmas rush of handmade is now over and now I can relax and wait for projects to appear. I did receive a text yesterday from a good friend (Sarah) who asked me to make her a Kindle Fire cover and I replied a definitive YES. Looking forward to researching tutorials and fabrics for her. They're all very cute! And your nieces/nephew seem extremely pleased. Isn't it fun? I'll check out the bag tutorial--nice project. You have made a bunch of kids happy and one old lady quilter happy with the slow winding bobbin tip. So glad you beat your deadlines! 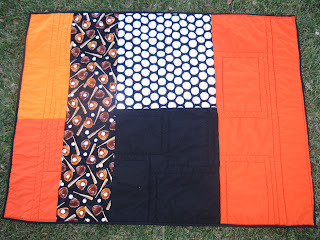 ;-) The quilt looks great, and I copied your idea of pouch & gift card - went over well here too! 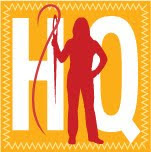 Susan - I just discovered your blog and your podcast, and I am LOVING them! 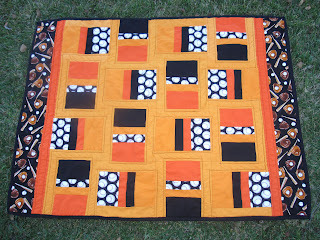 I am a quilter and general crafter, and have recently become interested in learning the history behind my favorite hobbies, so I was thrilled to come upon you. And as an added bonus, we are neighbors! I live in HB and work in LB. How awesome! Anyway, thank you for the wonderful information you provide. I still have about 7 more podcasts to go before I am caught up. 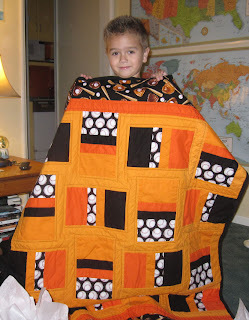 I hope to get that done this weekend while working on a quilt. Keep up the great work! Happy New Year!